The Price of Adventure. No Really. You Need a Job. We would like to think that we are free travelers with the endless opportunity to run amok, living out of our vans and eating what nice passerby hand us. Unfortunately, this is not the case. As with all things, travel and adventure has a high price, even when you’re just trying to get to the next town over. Where I live, in the middle of nowhere, every place that you go costs you a fortune in gas. I feel like I find myself filling up my tank yet again every three days. However, on those days where you’re groaning in the car and handing the nice man every dollar that you made the other day from behind the desk, consider this– what else would you be doing with this money? Buying some beers? New t-shirts? No. You didn’t. Instead, you spent it on something that you will have today, tomorrow– hell, the rest of your days. You have the great times that you spent with friends, or maybe even alone, going somewhere that you love (or somewhere that you escaped and then went back home, yet again somewhere that you loved). One thing that a friend pointed out to me the other day was the app Gas Buddy (which is free!) which compares both the distance and prices of gas stations all around where you are. You don’t have to make an account, either– just enter your zip code and you can see the varying gas prices around, all posted by other irritated travelers, just like you. You would think this self-sustained app would be a bit unreliable, but surprisingly, it seems like some people are really committed to posting gas prices. Another tip that I found in a magazine or something was to fill up your tank in the morning, when the air is cooler. 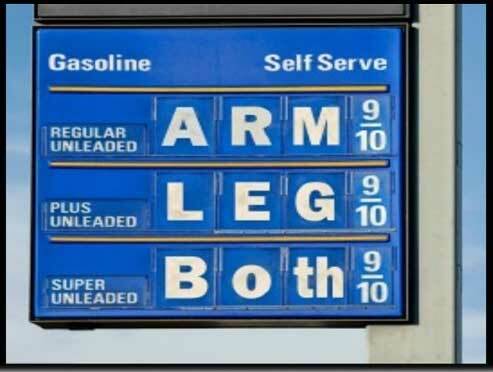 This will allow you to get a little more bank for your buck because the gas will be denser and you’ll really be getting that “full” gallon. So be proud, soldier. Drop a couple bucks on gas and get in the car. Make sure you put a pillow in there, though, in case you end up sleeping in the car again.